Inka next to the Bridge of Dun. A walk near here with him did not go quite to plan. One thing leads to another. Last week I wrote about the Iron Kirk and that brought to mind another iron structure I hadn’t seen for a lot of years. It’s nearer to home and I knew a visit to it would lead on to an ideal riverbank walk for Inka. I headed for the former Bridge of Dun station, now home of the Brechin Railway Preservation Society. Bridge of Dun was a stop on the old west coast London Midland and Scottish Railway (LMS) London-Aberdeen railway line. It closed around 1967, one of the hundreds of victims of the Beeching Report which brought new meaning to the phrase “railway cuttings”. 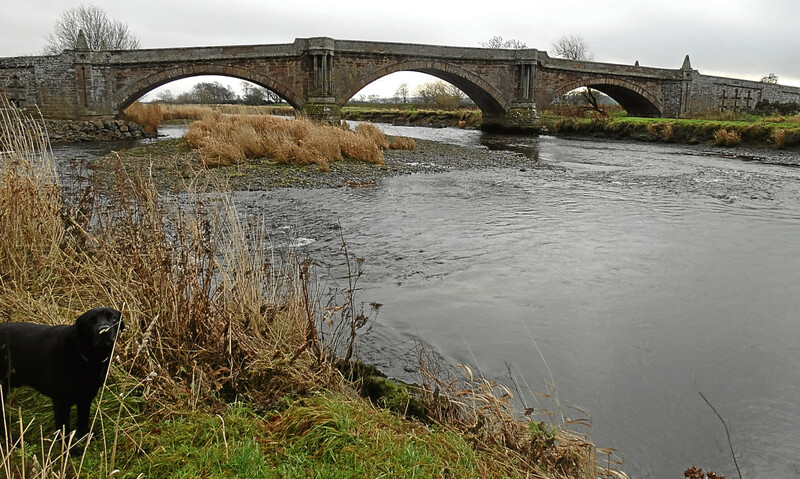 I crossed the actual Bridge of Dun, with its three spans over River South Esk, and took first right to Haughs of Kinnaird. A mile or so on the road crosses the track of the long-defunct Bridge of Dun-Friockheim railway line, where I parked. There’s a short walk to the bank of the river and the iron footbridge which crosses it, using the stone pillars of the old railway bridge for support. The deck has been worn shiny by countless boots, which spooked Inka initially. So I marched across and waited for him to join me. My problems weren’t over. There’s a steep wooden stairway on the other side and Inka was unwilling to go down it. He threatened to jump down about eight feet. I was having kittens by this time, imagining broken bones, so I grabbed his collar and walked him slowly down the steps to the ground. There’s a black and white photograph somewhere in the family archives of my mother sitting on one of the bridge pillars holding a fishing rod. It was the first time she had fished and she stopped when she had caught 22 finnock (young sea trout). She never fished again and perhaps that was the best way – stop when you’re ahead of the game. She was always able to say that the last time she was out she caught 22 finnock. It was a dreich and damp day. A sneaky, chill wind was coming off the water and my fingers were nipping. I’d hoped to see some birdlife – maybe mallard puddling about in slack water, or a hunting heron – but the weather had a dampening effect on the wildlife too. I heard the beating wings of a couple of swans and distant calls of geese but never saw any of them. The geese would have long flown off their roosts on Montrose Basin and been feeding on the stubbles. Black headed gulls (although they lose their cap of black feathers in the winter) were squabbling somewhere down the river. The only bird of note was a merganser, which flew low and fast upriver. We walked down the river as far as the Bridge of Dun. Along the bank are several benches for weary fishermen, and dog walkers. What a blessing the bridge must have been for travellers when it was opened in 1787, saving a long walk round by Brechin. It has semicircular pedestrian refuges built out over the river so that travellers could leap nimbly out of the way of phaetons and curricles, and stagecoaches with their high stepping four-in-hand horses, as they came clattering down the turnpike. Nowadays, folk stand in them and lean over the parapet to watch for salmon and sea trout making their way upriver to the headwaters to spawn. Back in the car I carried on towards Kinnaird Castle, turning left for Farnell at the crossroads. My father told me that the stone wall running alongside much of the road, and enclosing Kinnaird Park policies, is 17 miles long. I’ve never checked how true this is but if your father tells you something like that at a receptive age, you tend to believe it for ever. With age comes responsibility. I was asked once again by Tarfside WRI to be Santa Claus at their annual Christmas party for Glenesk and Tarfside Primary School children. It’s a great compliment but it’s an undertaking fraught with apprehension as there have been years when I have reduced at least one of the very tiny partygoers to tears. I feel a certain sympathy for them when I look in the mirror once I’m all dressed up and realise their first experience of Christmas cheer is me. I’ll finish with the opening lines of A Visit from St. Nicholas (aka Santa Claus) by American poet Clement Clarke Moore who died in 1863, which sets the scene of Christmas of a long bygone generation. I doubt if sugar plums feature in today’s new media age kids’ expectations.